Based on all indications, President Donald Trump is bent on proving that Democratic leaders in Congress have no interest in negotiating a deal that would end the ongoing partial government shutdown and invest in border security. About a quarter of the government ran out of money on Dec. 22 due to the border wall disagreement between Trump and Democrats. Some 800,000 government workers missed their paycheck more than a week ago, while the administration is trying to keep affected agencies running as smoothly as possible. Over the past month, Trump put forth a variety of options to allow Congress to deliver on his demand for border wall funding. He reportedly indicated a willingness to accept less money, adjusted rhetoric, and included priorities of his opponents—he even moved to territory that may irk part of his base. Still, he was snubbed by Democrat leaders. When Trump laid out his latest proposal in a Jan. 19 televised address, House Speaker Nancy Pelosi (D-Calif.) had issued a rejection before he even started to speak. Since it became clear in December that the Congress wouldn’t budget the wall funding on its own, Trump offered a number of concessions. He dispatched Vice President Mike Pence to field an option to lower his demand to $2.5 billion from $5.7 billion for the wall, sources told NBC News—an offer Trump didn’t confirm. Trump also overhauled his rhetoric. He started to equate a border wall with a border fence made of steel slats, having deferred to the judgment of border security personnel, who advised they need to be able to see through the barrier. He further explained that the wall only needs to be along 500–550 miles of the roughly 2,000-mile southwest border, a clarification in line with his campaign literature, but seldom uttered in his public speeches. He also bundled the wall funding with additional money for drug detection technology at ports of entry, hiring 2,750 more border patrol and other personnel, and 75 more immigration judges—all measures with significant support by Democrats. On top of that, he included $800 million for humanitarian assistance at the border and even a three-year legislative extension of the Deferred Action for Childhood Arrivals (DACA) program, which shields from deportation illegal immigrants brought to the United States as children. The DACA extension is sensitive ground for Trump because about one-sixth of his base opposed giving illegal childhood arrivals legal status, according to a February 2018 TargetPoint poll (pdf). 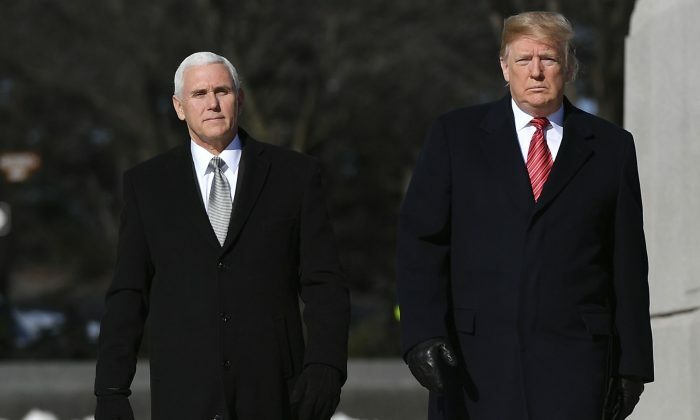 Trump is also willing to further negotiate with the Democrats through the legislative process, Pence said in a Jan. 20 Fox News interview, as the Republican-led Senate is expected to put the Trump proposal to a vote. “He set the table for a deal that will address the crisis on our border, secure our border, and give us a pathway to reopening [the government],” Pence said. Democrats say they want Trump to open the government first and then talk border security. Yet, as Pence pointed out, Pelosi indicated that reopening the government would effectively end the discussion on wall funding. When Trump asked Pelosi whether she’d give him the wall money if he let the government open and allowed for a month of negotiations, she said no. In Pelosi’s latest rejection, she complained Trump didn’t offer a permanent solution for DACA, which would imply a pathway to citizenship. But, as Trump suggested, that would be giving away the farm. “No, Amnesty is not a part of my offer. It is a 3 year extension of DACA. Amnesty will be used only on a much bigger deal, whether on immigration or something else,” he said in a Jan. 20 tweet. Democrat leaders also maintain that the $5.7 billion Trump requested for the wall is wasteful. Still, Democrats in the past supported far more lavish border security proposals, including the Secure Fence Act of 2006, which called for 700 miles of a double-layered border fence priced at $50 billion over 25 years. Congress ultimately didn’t appropriate enough money for the plan. Customs and Border Protection invested a mere $2.3 billion into the fencing by fiscal 2015, according to the Government Accountability Office (pdf). Lacking progress with Pelosi, Trump has been working on alternative plans. He’s put together a team of negotiators led by Pence to engage “rank-and-file members of the House and Senate,” gathering the input of Democrat legislators. The administration may attempt to tailor the deal to suit individual lawmakers, who then could dissent from Pelosi’s party line and still justify the move to their constituents. So far, however, there’s no indication that Trump has on his side the 19 Democrats needed to overcome their majority in the House or even the seven Democrat senators he’d need to break a filibuster in the Senate. With the absence of congressional approval, Trump has floated executive action. He’s already demonstrated that he can get military help along the border, and have the troops reinforce part of the existing fencing with razor wire. The next step could be a declaration of a national emergency, which would give the president additional powers to redirect federal funding. Some legal scholars argue that since Congress already approved 700 miles of fencing in 2006, Trump could use the emergency powers to pour military funds into the construction of the barrier. Such a move would likely get contested in court. Federal judges have repeatedly put Trump’s executive actions on hold, especially those pertaining to immigration, such as his nixing of DACA more than a year ago. Since then, however, a second Trump appointee has been confirmed to the Supreme Court, securing a 5–4 majority of justices presumed to lean conservative. Trump picked jurists that favor interpreting the Constitution as written, which doesn’t necessarily mean they’d side with him—but it gives him some assurance they won’t bend the law against him.